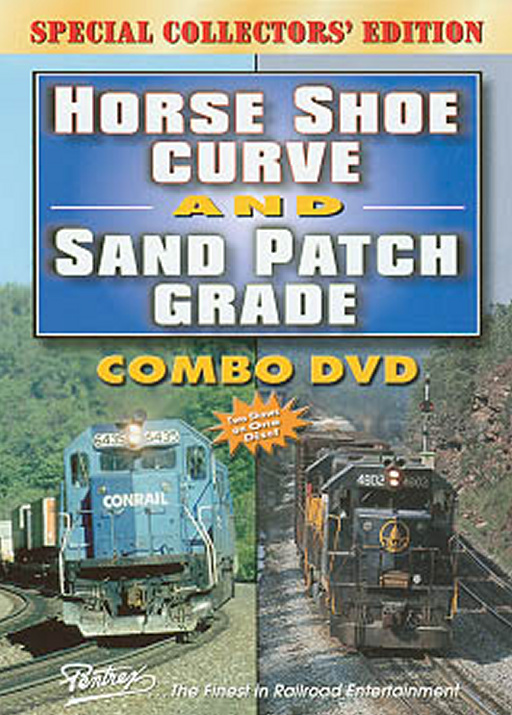 Horse Shoe Curve and Sand Patch Grade are two Pennsylvania railroading landmarks of enormous popularity, with good reason. They share long history, challenging terrain, heavy traffic, and innovative technologies. Pentrex recorded these famous sites in the late 1980s and released two outstanding shows, both of which are included on this new combo DVD. Roesler (Curitiba, PR - Brazil) on 2014-12-07 06:57:29. The program shows a quick glance at these "highlighted" landmarks routes with a brief description of those places. Despite the "age of program", it has a good quality footage and the best of it is the "old 80's rolling stock", that is, IMHO, the joy of railroading. I bought this program in a promotion: a bargain! Another Pentrex highly rated in my collection. Sandpatch: A very interesting variety of Power from different fallen flags. Very impressive. The region is shown in near complete detail, in various weather conditions, like the region regularly sees. Only being an hour from Horseshoe, it makes for a great side trip and adds to the adventure of Southwestern Pennsylvania. Horseshoe: 1st impression of this segment was "to much right at the Curve", but after viewing the movie several times, it only helps to grow on the Railfan. Lots of Trains shot from lots of different angles. The region near Horseshoe is covered as well. chris collins (fletcher north carolina) on 2015-09-02 06:02:15.